You may cry while listening to Life's Trade. Your tears will be real, honest tears, borne of the knowledge that someone, somewhere, is so acquainted with hopelessness that he can capture it in sound, carve it in stone so transparently with weeping guitars and funeral procession drums and deep screams that creep up the vertebrae like they were rungs on a ladder. That this heart-rending expression of pain comes from a Kansan doom metal band named after an ancient Greek island matters not. Life’s Trade is as purely emotional an album as you will find in any genre, and if you can’t at least perceive that, there is no hope for your soul. Despair wears many guises in heavy metal, whether it’s the doleful sorrow of English gothic doom, or the nihilistic hatred of Norwegian black metal. Samothrace looks closer to home for inspiration, straight to the dusty well of southern blues. But there is none of Eyehategod’s ugly, whisky-soaked lurching on Life’s Trade. “Cacophony” is anything but -- its thick, tolling chords sound like the mournful hell-howling of Robert Johnson, corroded by distortion pedals and vocal nodules but beautiful all the same. Guitarists Bryan Spinks and Renata Castagna jam their molten riffs like a metallicized Allman Brothers; solos glide delicately over the end-vamps of “La Llorona” and “Cacophony,” raw and virtuosic as vintage J. Mascis. Lyrics are short and telegraphic, vehicles for Spinks' throaty scours. "Life's Trade. Souls sold. Weight's felt. Gods break." Strained vowels stretch out over the long expanses between guitar crashes, electric winds howling over the plains. 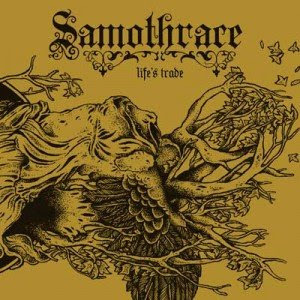 Producer Sanford Parker (Nachtmystium, Buried At Sea, Indian) proves once again that he can squeeze nuance out of even the most overpowering sounds. Doom metal rarely feels this personal. This is one hell of a good album. Looking forward to catching them live sometime. Party on, Wayne. They're playing a house party in L.A. in a couple weeks and I couldn't be exciteder. Thanks for reading!